Voting for the gaming Oscars has opened, with the 31st Golden Joystick Awards now asking for your input on the finest gaming titles of the year. The Joysticks - run by TechRadar's publisher Future - has 15 categories that include the headlining Game of the Year award and the 'Most Wanted'. Of course, with just weeks until the launch of the Xbox One and the PS4, the Most Wanted will take on an even bigger importance this year as we move into one of the most important periods of all time in gaming. Both consoles are in the list of nominations as are the innovative looking Xbox exclusive Titanfall, Elder Scrolls Online, Thief, Watch Dogs and The Division. Back to Game of the Year and the titles vying for this honour include massive names like Halo 4, Call of Duty: Black Ops II, Far Cry 3 and Bioshock Infinite - as well as brilliantly innovative The Last of Us, Dishonored and Hotline Miami. 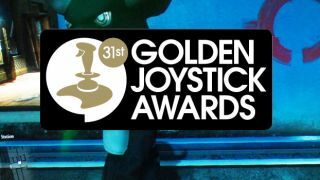 The voting is open at http://www.goldenjoystick.com and will be announced at The Westminster Park Plaza in London on October 25.